The generation of the ‘foodie’ is in full swing and with so many date nights revolving around the devouring of delicious cuisine, food really is the way to the heart. But how about mastering how to cook the food (mastering is a slight exaggeration in our case) rather than being served it in a restaurant? 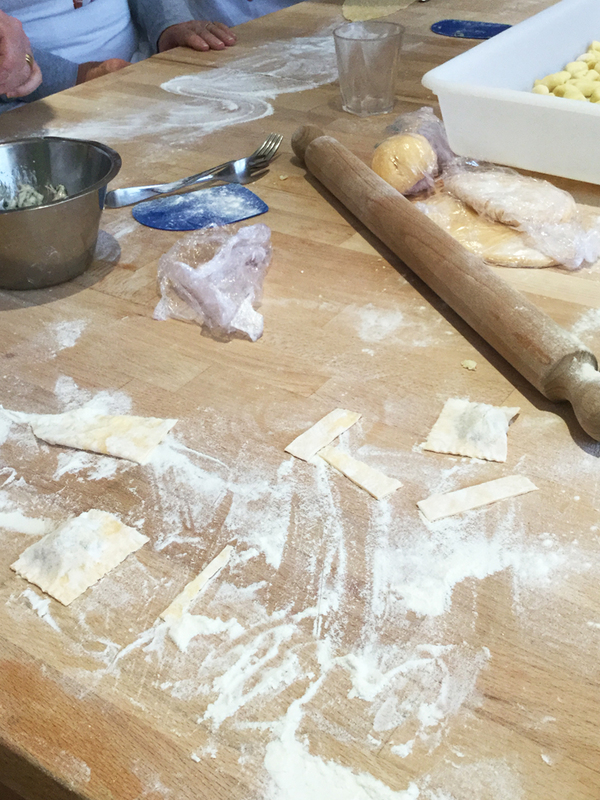 Here at Hero & Leander we decided to take the bull by the horns and enrol on an Italian Pasta Workshop at La Cucina Caldesi – the only Italian cookery school in central London. Why Italian? Well that’s easy; Italians radiate romance and are fiery and passionate, translating into divine food – plus we also secretly crave a Lady & The Tramp spaghetti moment, but shh don’t tell anyone! Tucked down a little cul-de-sac just off of Marylebone Lane, La Cecina Caldesi is secluded and quite intimate – a good start for a date. It doesn’t at all feel as though you have just stepped off of the bustling streets of London. If we’re being completely honest we were very nervous about starting the course. We had little to no pasta making experience and were concerned that our lack of skills may show. Thankfully the wonderful staff immediately calmed our nerves and reassured us that we would be fine – famous last words. Aprons on and we were ready to start. The class was a reasonable size (around 16 people) made up of couples, friends and single food enthusiasts, spanning a good range of ages. Crowing round the large wooden preparation tables chatting over Italian coffee and homemade biscotti before our chef/teacher for the day entered. Stefano Borella introduced us to the menu and the ingredients we would be using and went through a quick rundown of what we would be making; Scialatielli alle vongole, Pasta Verde, Lasagne and Gnocchi al ragù di salsiccia e semi di finocchio to name a few. The only piece of salvageable information from my mind was that we would be eating what we had produced at the end – yum! And so we began. The wonderful charismatic Stefano has worked in many establishments over his career including “San Lorenzo”, “Savoy Hotel”, “Churchill hotel”, “Mayfair hotel”, and presently “Caldesi” restaurants. Having been involved with all of the Calder’s projects including Katie Caldesi’s latest cookery book, the “Italian cookery course”, Stefano has a wide knowledge and genuine love of Italian food. This passion is evident throughout the class and we love the authenticity of being taught how to cook Italian food by an Italian – after all, they know best. 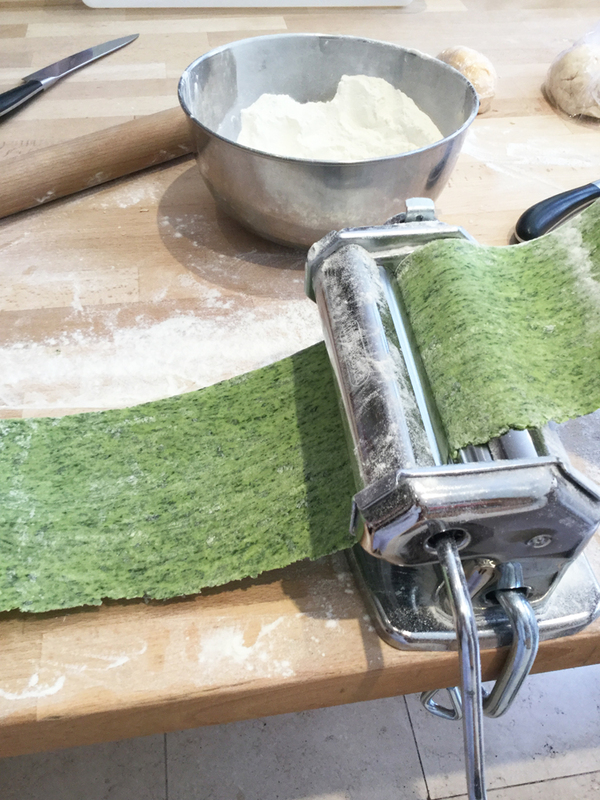 We started by making Pasta Verde, a green spinach pasta that we later found out is probably one of our favourites. The ingredients and recipes are scattered over the large wooden table and under the guidance of Stefano and his team we began making. A little whizzing of the egg and spinach, mixing with flour and a LOT of kneading later, we were ready to roll out the pasta. For those of you who have a pasta maker sitting in a cupboard unopened (and yes we are guilty too), after a class at La Cucina Caldesi you will be inspired to dust it off and use it. We feed our pasta mix through the rollers and slowly adjust the settings to produce a long thin sheet of pasta – who knew that pasta making was easier with two people! 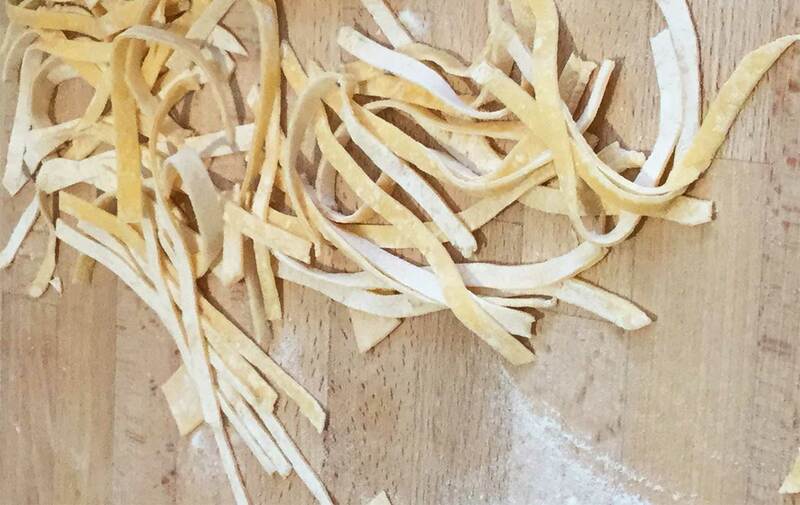 Next we were shown the various attachments that can be used to cut the pasta into strips but that looked a step too far for us so we sliced it by hand taking half the pasta each to see who could make the neatest tagliatelle – a little bit of healthy competition on a date hurt nobody. Unfortunately, what should look like beautiful streamers of tagliatelle turned into what can only be described as flat worms. Stefano reassured us that Italian cooking is rustic and not to worry but we fear that he was trying to make us feel better. We continued following the various recipes making gnocchi (delicious but yet again our attempt was unappealing to the eye), sheets, herby pasta and even gluten free pasta. Once everybody had made enough pasta to feed a small Italian army we moved onto the sauces. First step, chopping the vegetables. We had a knife masterclass on how to tackle each vegetable from onions and carrots to chilli and tomatoes. This was a lot of fun and yet again slightly competitive. We have always envied the Samurai knife skills that chefs seem to possess, so to carry home a little bit of knife 101 knowledge will prove to be handy at home. Onions can be chopped without making you cry! There is hope yet. Stefano demonstrated the sauce making and the importance of using LOTS of quality olive oil, LOTS of salt and good Italian wine – we won’t argue there. The Caldesi team set up the tables for lunch and we all took our seats for the moment we had all been waiting for; the eating. After spending hours of smelling the sauces simmering away we were well and truly ready to tuck in. Free flowing Italian wine graced the tables and the dishes were presented to us in large rustic serving bowls. There is something so satisfying about eating a meal that you have spent time preparing. The food was delicious and the company was wonderful. We spent the rest of the afternoon drinking, eating, being merry and quizzing Stefano and his team on their culinary prowess. Many glasses of wine and mouthfuls of pasta later, the dishes looked like we had hardly touched them. The Caldesi team came to the rescue with takeaway containers to transport our Italian goodies home for dinner. Tip: Do NOT plan dinner the evening of the class. 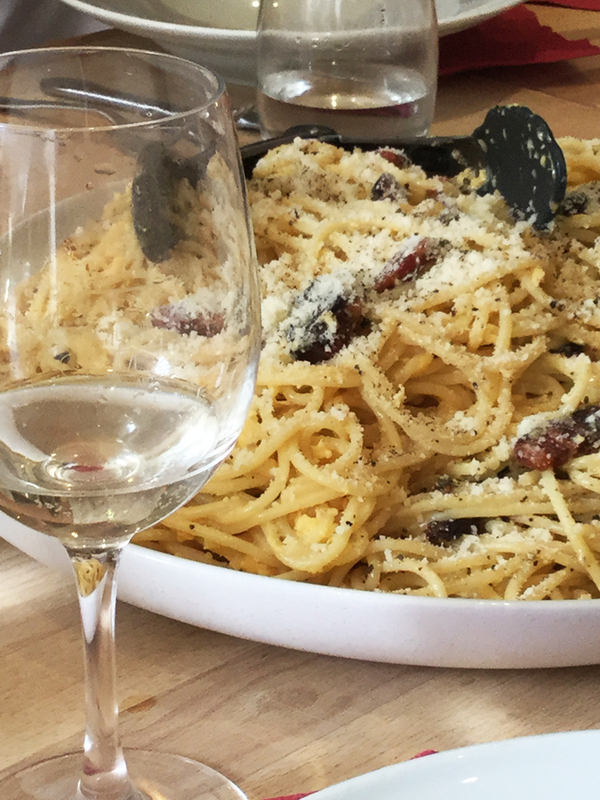 Pasta making was just one of the many courses on offer at La Cecina Caldesi cookery school. The school is a celebration of dishes from every Italian region including pizza, salads and pastries to name a few. Even if you don’t know your spaghetti from your spatula, there is something for everyone at La Cucina Caldesi. They cater for all levels of skill and teach children as well as adults. It may not be a conventional date but who enjoys conventional anymore anyway. The classes are fun, social and informative with hopefully providing you lifelong skills that you can recreate at home. Luckily for us presentation is not key, making way for spectacular flavours instead but if all else fails, the restaurant attached to the cookery school Caffe Caldesi, can offer Italian home cooking in the heart of Marylebone. Buon Appetito!